Our downstairs bathroom is done just in time for all our holiday guests. Whoohoo! 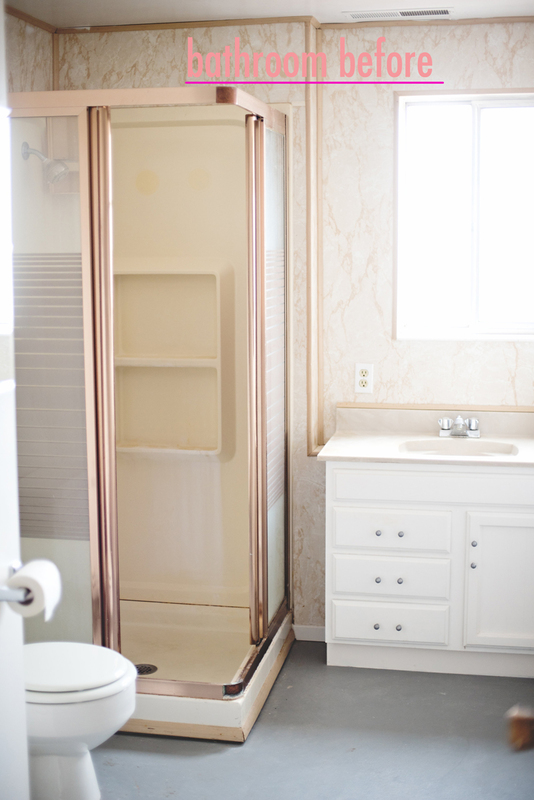 This bathroom was supposed to be our “easy” fall project before jumping into the master suite, but 3 months later and I have to say it was one of the most challenging rooms to date. From a custom built shower pan (I didn’t even know this was a thing when we started this), to plumbing that got a little tangled up, parts of this project were honestly a bit crazy for us to handle. 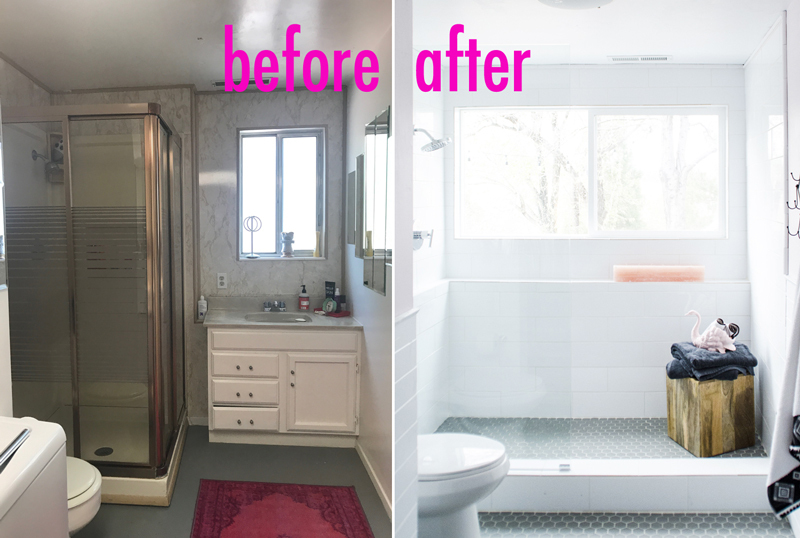 Matt worked so hard on the space and although I’d never call it easy – the entire bathroom sure did come out beautiful. 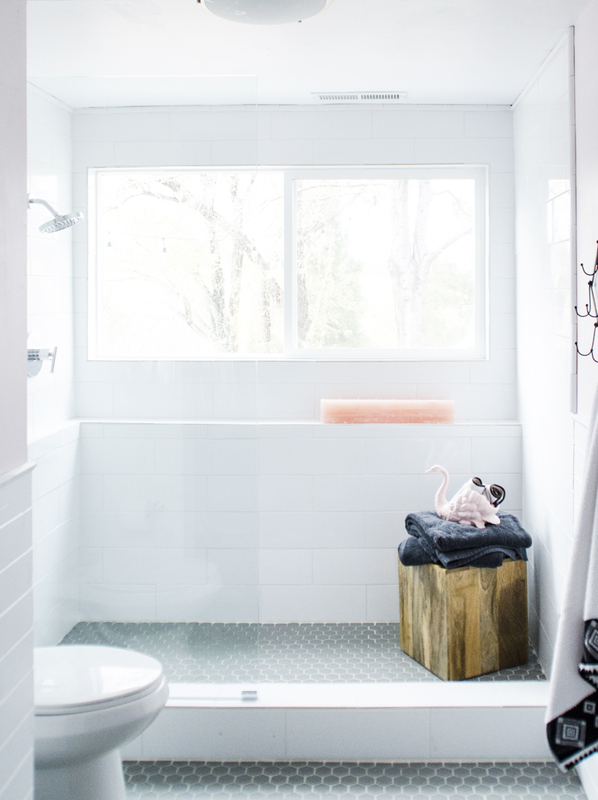 Now instead of a dingy bath/laundry combo that screamed basement utility room – we have an open concept spa like retreat that is flooded with natural light. First things first, let’s take a peek into see what the space looked like before. The bathroom before had basic concrete on the floor with a really bad paint job. It featured an old shower that reminded me of a phone booth, but was leaking and too small for anyone to really shower in. A tiny window and florescent overhead lighting. Plus with the bath/laundry combo it had all the makings for a basement utility space that seemed functional, but not much else. 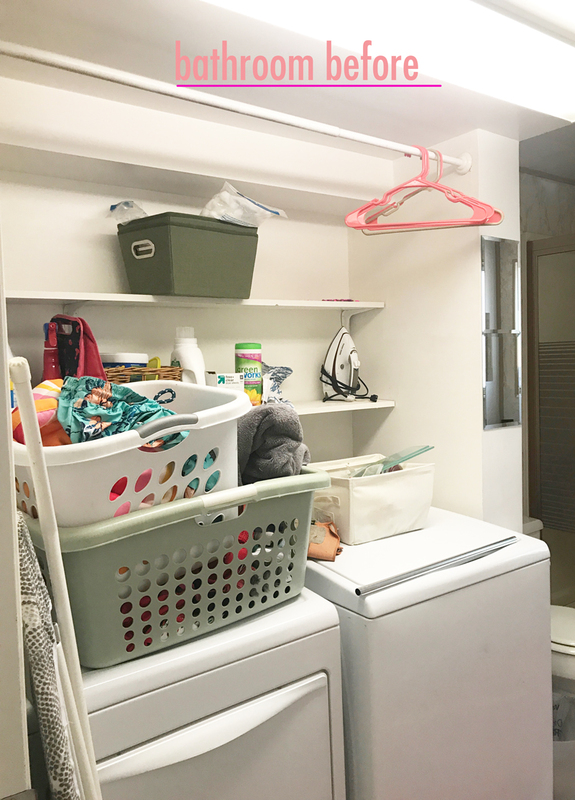 The first thing we did was to move the laundry room to the next room down the hall, we finished that room this fall and you can see the basement laundry room renovation right here. 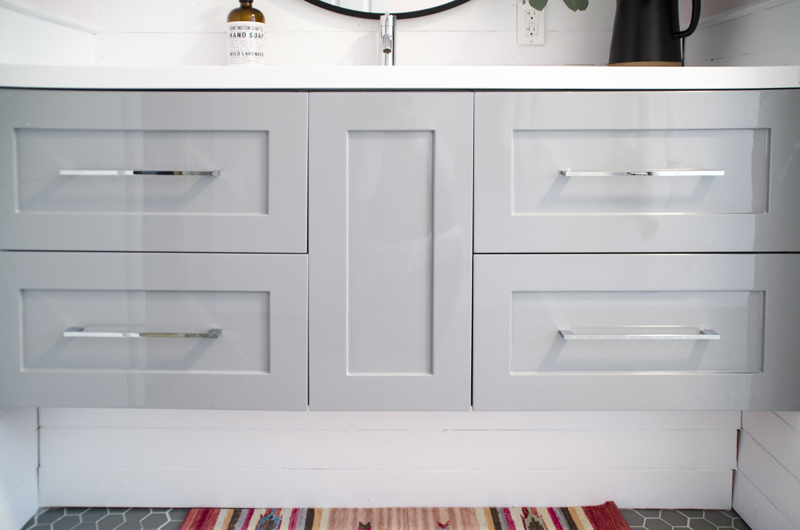 Once the washer and dryer were out of the space we had a chance to open it all up and created both a full vanity area and a huge walk-in shower. The next step was opening the back wall and installing a much larger window. The window points out to our backyard and lets in an enormous amount of gorgeous light during the day, making the space feel like it is up in the trees instead of in the basement as it is. 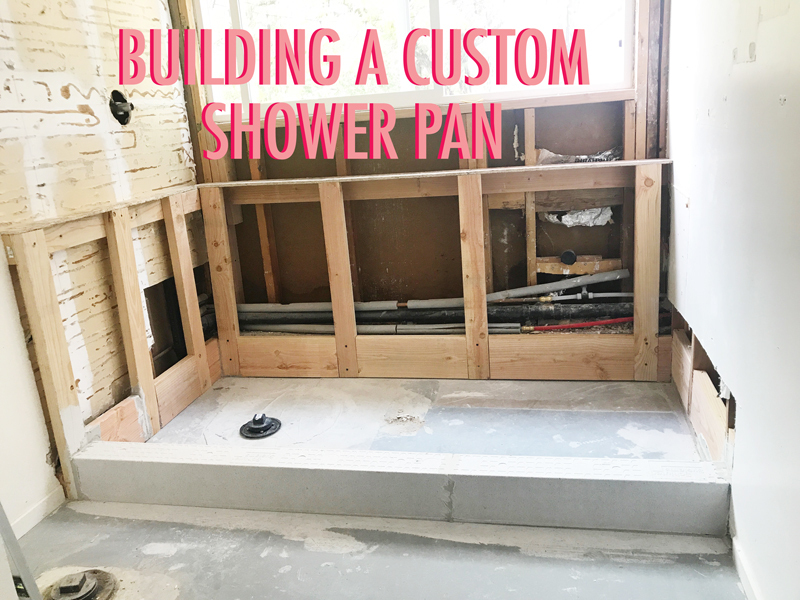 Along with the large and wide window installation, Matt built us a custom shower pan. The reason we ended up having to go custom is because this shower stretches over 80 inches long and the largest shower pan we could find commercially was only 72 inches. I’m not going to go into all the steps for building this out, but if you desire to have a VERY large shower, be prepared for a VERY large amount of work. 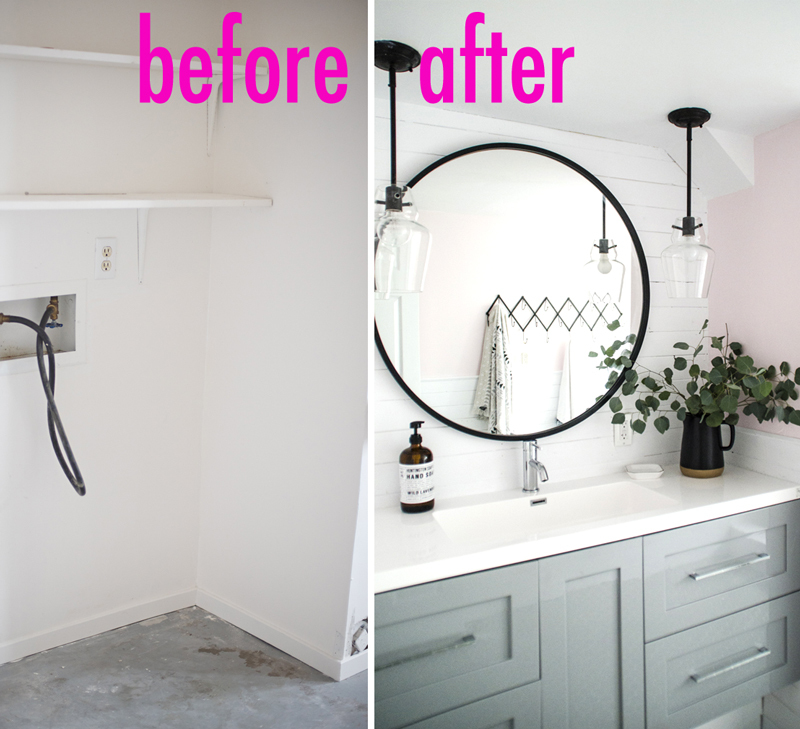 ;) Here’s a video we used as a guide in the process, also Apartment Therapy has a good DIY on it, although they make it sound WAY easier than it actually is. It took him about 2 weeks of mudding, drying, leveling and mudding some more. Lots of fun! In the end, all that crazy work was totally worth it to get a shower that is huge and amazing! 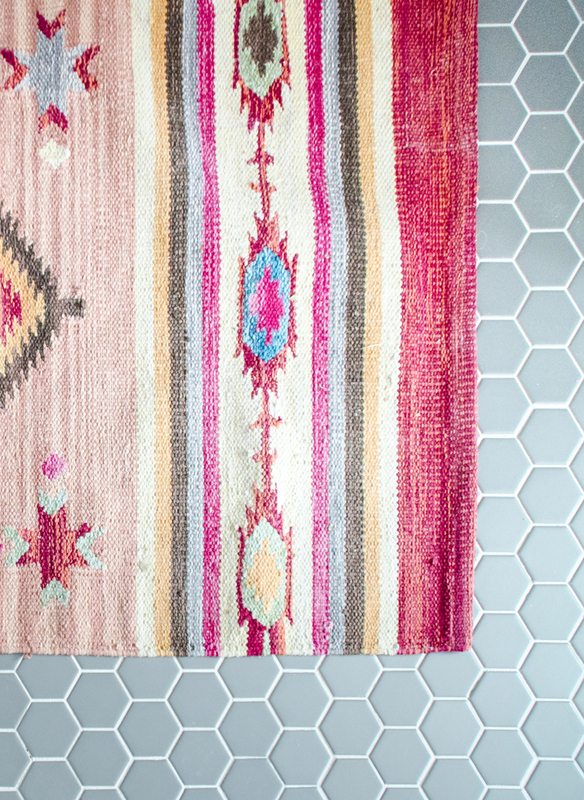 Now let’s talk about this tile… We went with a tiny grey hex for the floor. All the flooring in the house is either our white washed pine wood or some form of grey tile, we have large rectangles in the kitchen and another version of grey in the upstairs guest bathroom. Since I wanted to stick with grey – these grey tiny hexagons do wonders for setting this room apart as truly a special place. 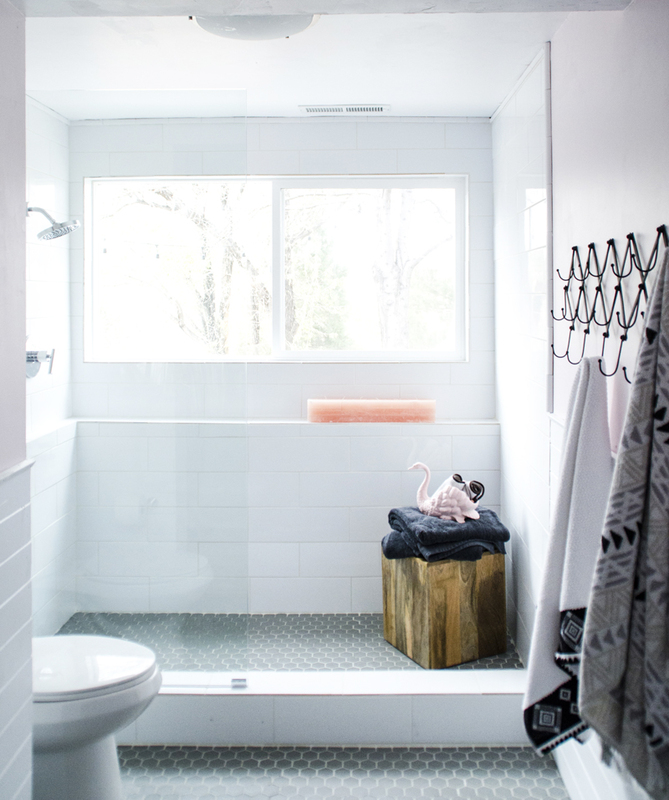 The grey floor tile looks so perfect against the very large version of white subway shower tile. 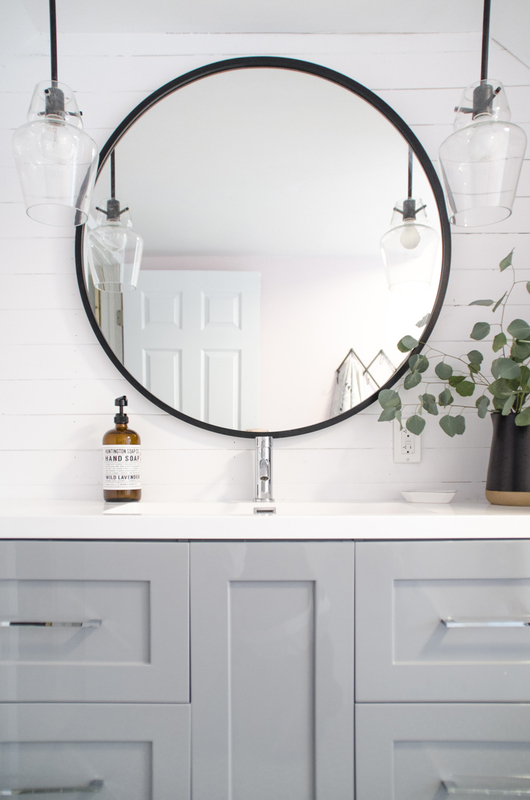 I knew we wanted to carry on the 1/2 wall wood paneling from the laundry room in this space, so the white subway along with the white wood on the walls makes the bathroom feel serene and open. All our tile is from Floor & Decor. I love that I can go in to my local store and see the tile in person, it is easy to bring samples home the same day and return anything we don’t love. 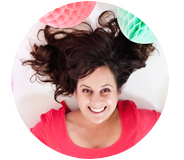 Making the tiling process so easy for me has really helped in finding the right tile for every space. 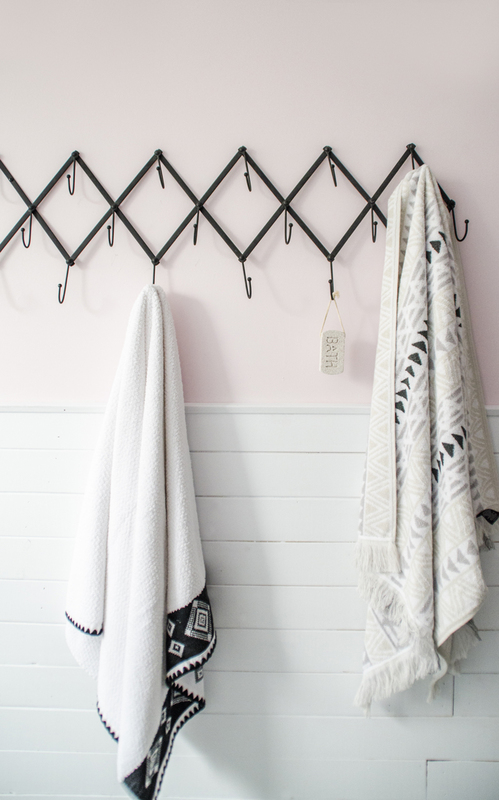 We put up wood paneling on the wall and painted the top a pretty pale pink, which goes good with all the striking black details in the space. 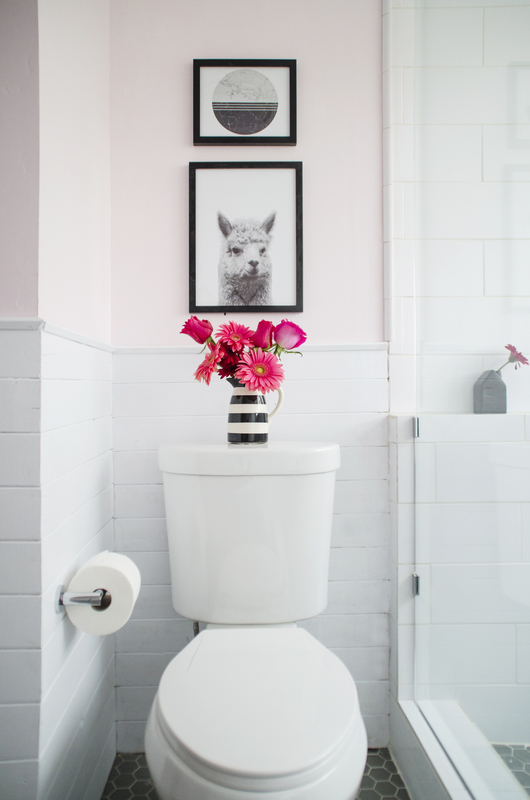 Even though it is pink, the bathroom doesn’t feel to feminine to me. I think it ended up nicely balanced with the boxy style of the space and the details put into it. We hung two black rod sconces on either side of the mirror to make the alcove look symmetrical and cozy. You can see in the before photos above that there was a very large soffit in this area above the vanity. We took it out and realized they had built the entire thing to hide one little pipe on one side that stuck out about 4 inches. In its place Matt built in the two side triangles. The result is a alcove that looks purposeful, gives a bit of architectural detail to the space and doesn’t take up a ton of important head room. 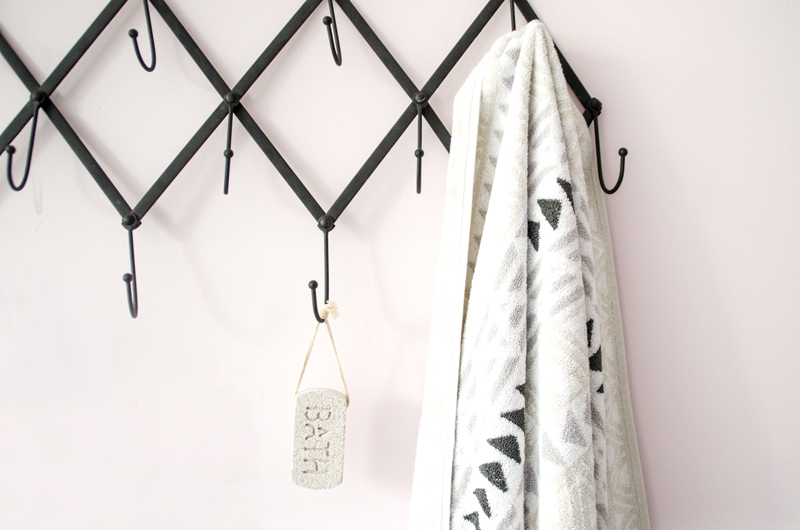 We added black details all around the room like my favorite lama photos and a long vintage inspired towel rack. I am thrilled to have this space done, it is really everything I dreamed it would be and I can’t wait for our holiday guests to start arriving and enjoy it fully. This post is done in paid partnership with Floor & Decor. 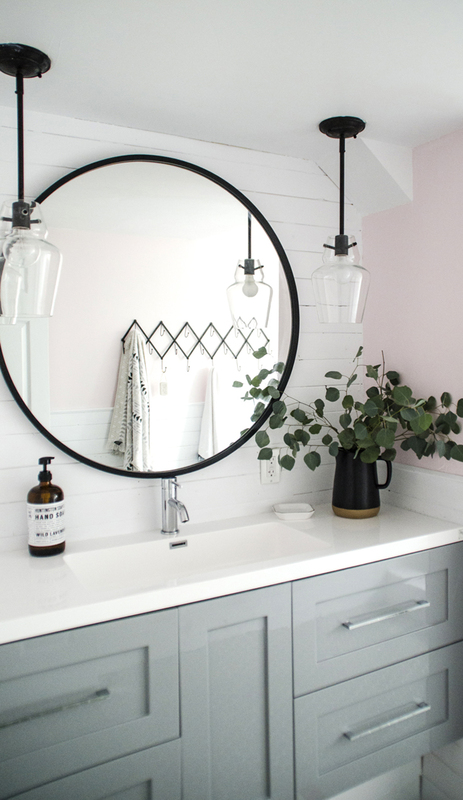 Here are all the sources we used in this space: Vanity, Mirror, Sconces, Rug, Floor Tile, Shower Tile, Shower Door Glass, Shower Stool, Black Towel Rack, Black Pitcher. What a fantastic transformation! You did a great job, and must be so proud. 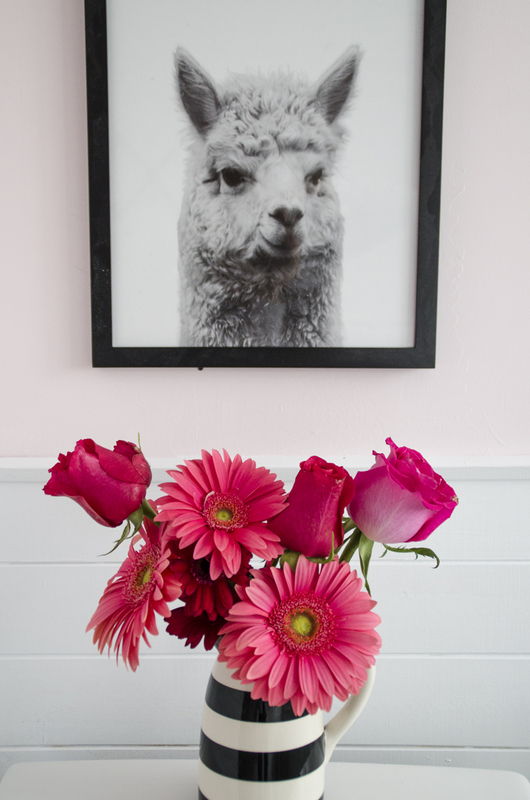 Would you mind sharing the pink paint color, and the source for the llama art?